We're livid when car dealers attempt to lure us with bait-and-switch scams. We speak our minds forcefully when we get suckered into any fraud, major or miniscule, be it from useless coupons or crummy products to services that don't deliver. Sears was actually forced by the FTC, in 1974, to "cease and desist" using deceptive tactics to draw customers into stores, then "switch their focus to products other than the advertised bargains." For the sake of sales and profits, of course. So why, then, do we allow fast food mega-corporations to deliberately fool us with the specter of fresh, healthy salads, when most of their mouth-watering "salad" concoctions are among the highest-calorie, saltiest, least healthy menu items? Make no mistake: their ruse is long-pondered, finely-plotted corporate-level sales strategy. Taco Bell's Fiesta Taco Salad with Beef - 780 calories; 1,340 mg. of sodium; 42 grams of fat. And that's before sour cream and guacamole. Jack-in-the-Box Southwest Chicken Salad w/ Crispy "ChickenStrips" and Southwest Dressing - 720 calories; 2,110 mg. of sodium; 45 grams of fat. 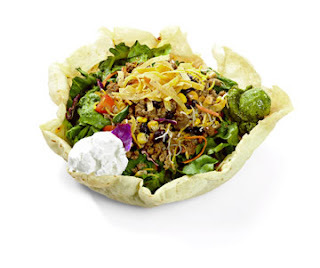 Arby's Crispy Chopped Farmhouse Salad w/ Buttermilk Ranch Dressing - 640 calories; 1,310 mg. of sodium; 46 grams of fat. McDonald's Premium Southwest Salad with Crispy Chicken, Newman's Own Ranch Dressing - 620 calories; 1,350 mg. of sodium; 36 grams of fat. KFC Crispy Chicken BLT Salad w/ Creamy Caesar Dressing, Croutons - 690 calories; 1,820 mg. of sodium; 48 grams of fat. A meal of three Hershey's Milk Chocolate bars might be a better health choice: 690 calories, but only 120 mg. of sodium. A Big Mac could be a much healthier choice, at 550 calories, 1,000 mg. of sodium, and only half the fat, at 29 grams of fat. These pseudo-health salads aren't fake foods. But they are fake real-foods. Intentionally fake healthy foods. I don't resent that Taco Bell, Jack-in-the-Box, Arby's, McDonald's, KFC, and others sell scrumptious, salt-and-fat laden "salad" choices. I resent that these mega-corporations subtly and not-so-subtly present them as healthier choices, when these fast food salads are awful nutritional alternatives. I resent that they hide behind website-only nutritional disclosure lists that are difficult to locate, much less decipher. I resent their intentional corporate campaigns to purposely fool consumers into buying these products. I resent this legal form of fast food bait-and-switch that succeeds because of its great convenience to our fast-lane lives. Americans are angry when car dealers and small-scale fraudsters mislead us into buying products under false premises. 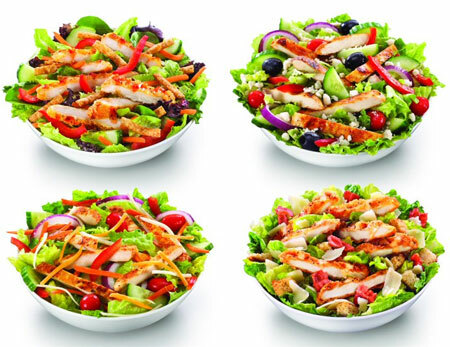 Why aren't we angrier about being misled into chowing-down these fast food corporate-designed "salads" that clearly hurt our health and well-being?